In 1519 Hernán Cortés and a small band of Spanish conquistadors overthrew the mighty Mexican empire of the Aztecs. 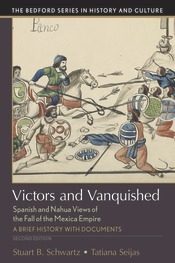 Using excerpts primarily drawn from Bernal Diaz's 1632 account of the Spanish victory and testimonies — many recently uncovered — of indigenous Nahua survivors, Victors and Vanquished clearly demonstrates how personal interests, class and ethnic biases, and political considerations influenced the interpretation of momentous events. A substantial introduction is followed by 9 chronological sections that illuminate the major events and personalities in this powerful historical episode and reveal the changing attitudes toward European expansionism. The volume includes a broad array of visual images and maps, a glossary of Spanish and Nahua terms, biographical notes, a chronology, a selected bibliography, questions for consideration, and an index. "[This volume] fills a gap in the historical literature by bringing together Spanish and Nahua accounts in a way that respects the original texts...while also providing succinct undergrad-friendly and up-to-date introductory analysis."